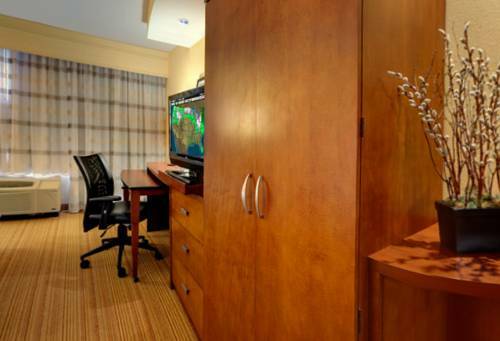 Stay at Courtyard Madison East and enjoy a convenient location and modern amenities. Our prominent East Side hotel is 5 miles from Dane County Regional Airport and offers a free shuttle to and from the transportation hub. We are near East Towne Mall, downtown Madison, the University of Wisconsin-Madison, Kohl Center and Alliant Energy Center and feature easy access to major companies such as American Family Insurance, Alliant Energy, Covance, GE Healthcare and QBE. When it's time to retire for the night, enjoy accommodations with plush bedding and complimentary Wi-Fi. The Bistro, our restaurant, is open for breakfast and dinner and serves Starbucks beverages and evening cocktails along with healthy and hearty menu items. In your downtime, head to our fitness center with cardio equipment and free weights or swim a few laps in our indoor pool to keep up with your exercise routine. Expect a relaxed travel experience in Wisconsin when you book your next getaway at Courtyard Madison East.